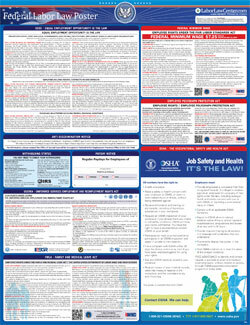 The Employee Right under the National Labor Relations Act is a workers rights law poster by the Federal Department Of Labor. This is an optional poster, so while it is recommended that you post this if it is relevant to your employees, you are not required to by the Department Of Labor. This poster describes the protection that those who are employed have to: not get harassed by unions or employers, be discriminated against because of being in a union and be treated fairly by the union. Those who are employed do not have to join a union. It appears you don't have a PDF plugin for this browser. Please see the link below to download federal-employee-rights-fnl.pdf. below, if you have any questions about specific rights that may apply in your particular workplace. benefits, hours, and other working conditions. complaints directly with your employer or with a government agency, and seeking help from a union. from the nearest regional NLRB office, which can be found on the Agency’s Web site: http://www.nlrb.gov. the toll-free numbers listed above. manner that discourages you from engaging in that activity. because you choose not to engage in any such activity. to discourage or encourage union support. pins in the workplace except under special circumstances. gatherings or pretend to do so. in making job referrals from a hiring hall. against you because of your union-related activity. joined or do not support the union. Act, and supervisors (although supervisors that have been discriminated against for refusing to violate the NLRA may be covered).